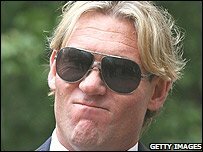 Crystal Palace chairman Simon Jordan has revealed he intends to sell the Championship club. Jordan, who bought Palace out of administration in 2000, says he has grown disillusioned with the game. The Palace chairman decided to quit after a Football League tribunal awarded the club just £700,000 following John Bostock's move to Spurs. "Without a shadow of a doubt, this is my last year. I've taken the club as far as I can," Jordan said. "It's my specific intention to find a buyer this season. I will do nothing to affect manager Neil Warnock and I will be absolutely committed to the club and I will find a responsible buyer. I realise that he's bemused by the tribunals conclusion, but is this really enough to make SJ quit football? "I am not de-motivated by the team, manager or fans. But I have been disillusioned with football for a long time. "I kept my sanity by pumping millions of pounds into my academy, feeling the saving grace of my club was finding players who would be chomping at the bit and honoured to play in the first team but that's been taken away from me as well. "Bostock was one of the best players my academy has produced in the last 10 years and he has been sold for a packet of crisps."